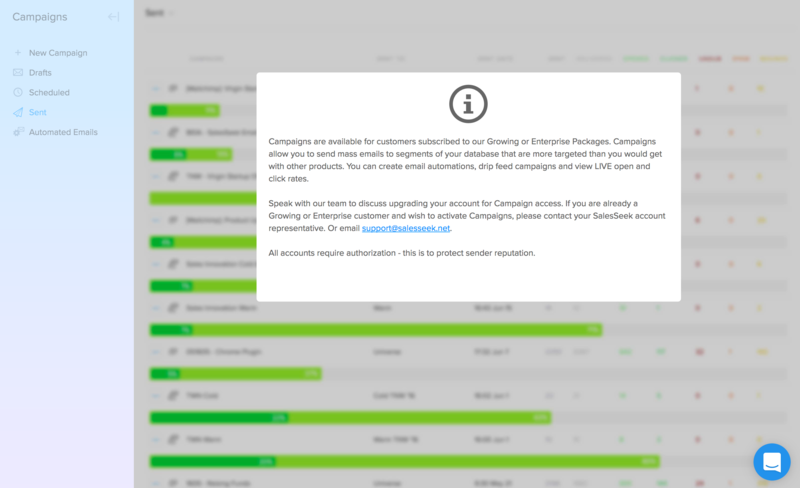 If you're a new user or looking at upgrading to our 'Growing' plan, you will notice the campaign section of SalesSeek is unavailable. If you're set on upgrading from your 'Starter' plan just contact us using the in app chat. If you're curious about the feature, this is a great place to look at it in more detail. Let's take a look at what you'll see after accessing Campaigns. Here is a basic list of draft emails. Some of these have been created in MailChimp using our handy integration. Other emails are just plain text 'Direct Emails'. First things first. 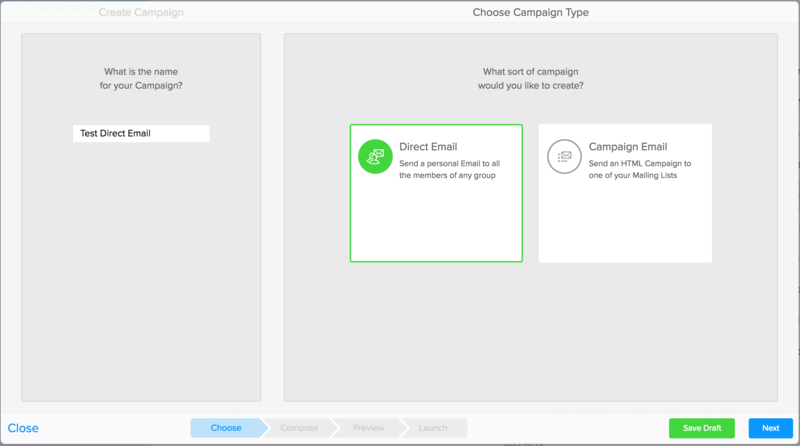 Do you want to send a 'Direct Email' or a 'Campaign Email'? 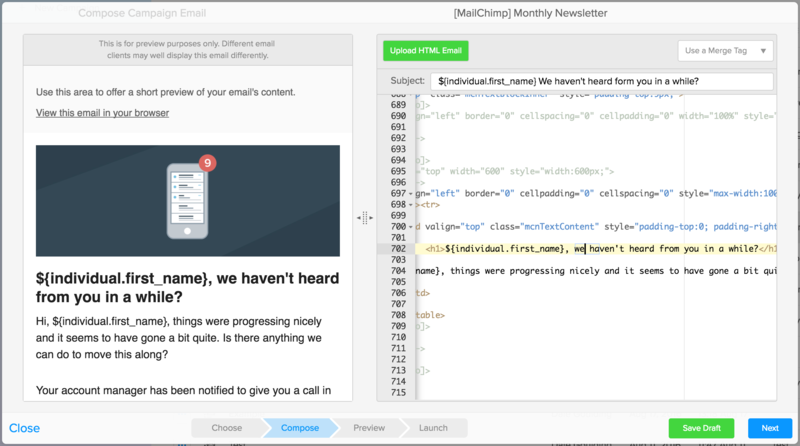 Campaign Email = Rich HTML campaign to any of your chosen Mailing Lists. Let's start by selecting 'Direct Email'. The first thing we do is to give your campaign a title. Once doing this you will be able to go the the next 'Compose' stage. Let's call this one 'Test Direct Email'. This name is only visible to your internal team. In the compose page you can start typing out your email. Notice the drop down menu in the top right 'Use a merge tag'. 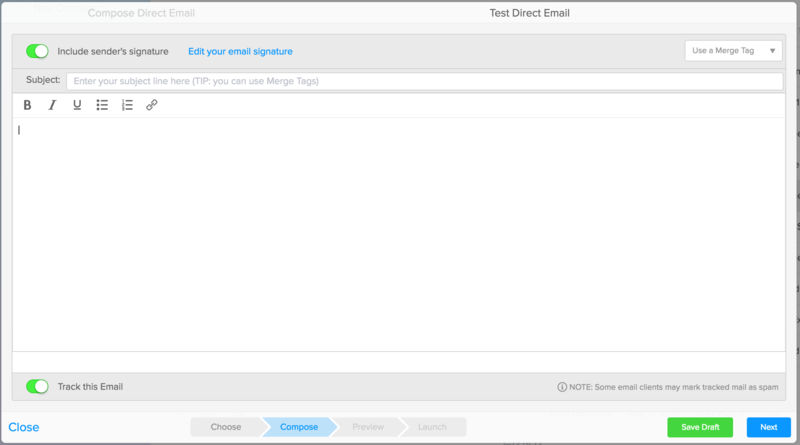 Use merge tags to personalise every email that is sent out. Now let's populate some of these fields. We will also use a Merge Tag to personalise it to every contact we send it to. When you're happy with your email, just click 'Next' or 'Save Draft' if you want to come back to it later. Preview the email and select who to send it to. At first your 'Preview' won't be available. Select who you want to send the email 'To'. Choose from a list of groups and to test the merge tags work, select an individual in the left column. 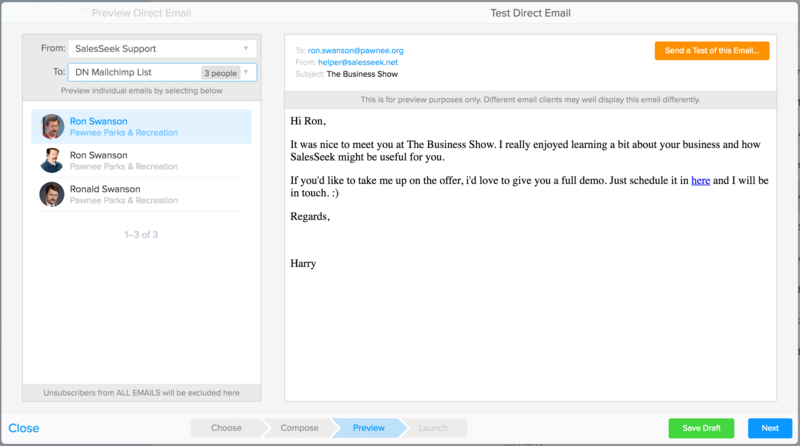 This will give you a preview of the email that individual will receive in the preview window. Notice how the merge tag has been replaced with the individuals name 'Ron'. Everything working properly? Let's push on. 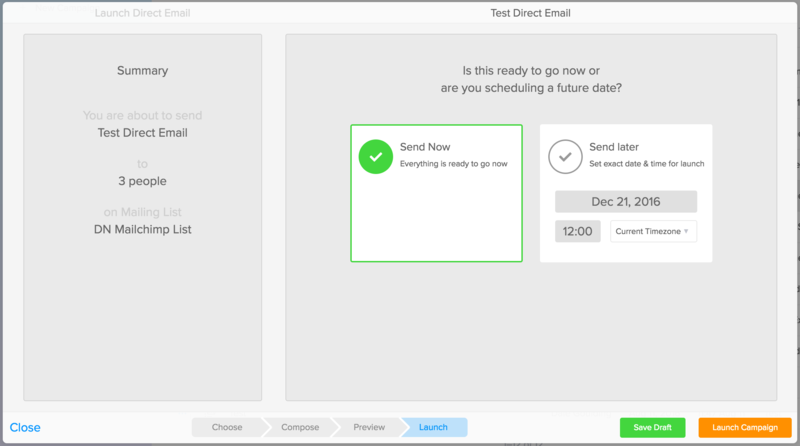 Schedule or Send your email in the 'Launch' stage. Once you've decided to hit Send or selected a time to schedule. Select the 'Launch Campaign' button and everything will be ready to go. The process follows the same steps with 'Campaign Emails' with a few variations. 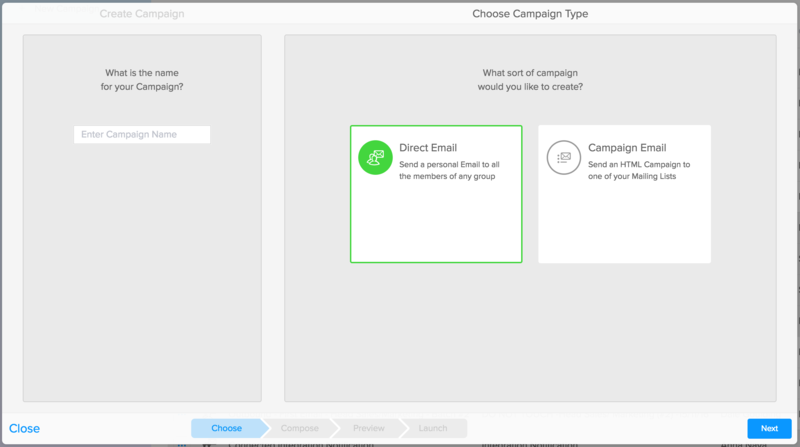 Unlike Direct Emails where you can send to a static or smart group, you will need to direct Campaign Emails towards a Mailing List. 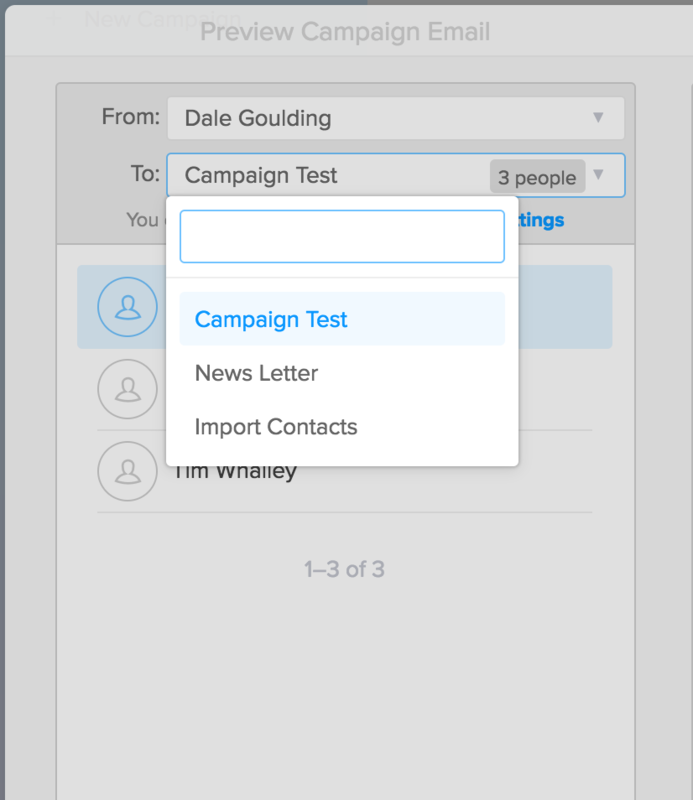 Instead of composing Campaign Emails in the SalesSeek's composer, use our MailChimp integration. 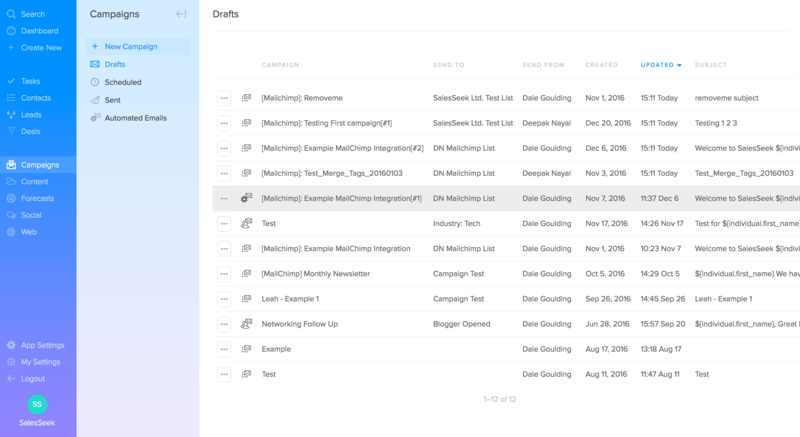 All the campaigns you create in MailChimp will appear in your 'Drafts' in SalesSeek. Now you can select the MailChimp email you want to send and you'll be taken straight to the compose stage. Here you'll have a preview of the email as well as a view of the HTML. You can edit using the HTML editor or you can move onto the next stage. 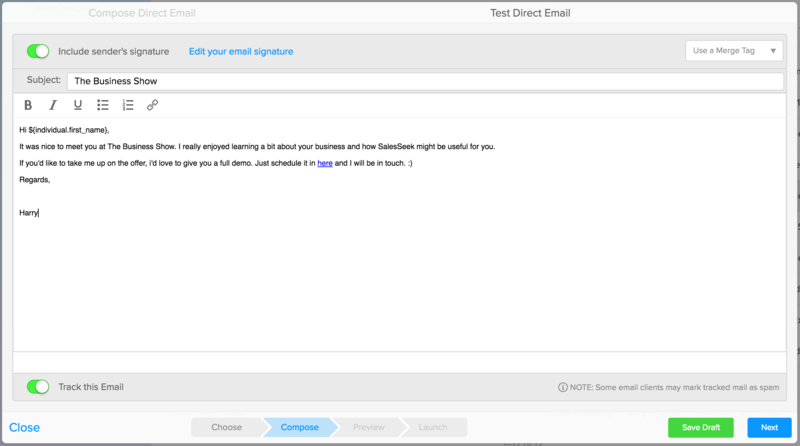 When selecting a where to send your email, the drop down 'To' menu will display only Mailing Lists. Choose a Mailing List and Schedule or Send your email. Easy. Still have questions? Just use the in app chat and one of our team will be sure to help you out.